An analysis of the bargaining power of suppliers will identify the extent to which your suppliers can choose to raise prices, reduce quality or reduce service without consequence. You will find that as the bargaining power of suppliers increases the industry profitability tends to decrease. However supplier power can vary, so watch for changes in power due to seasonal or economic cycles. The good news it that the bargaining power of supplier’s is similar to the bargaining power of customer’s section of the Porter Model. You will complete essentially the same analysis, only this time your industry is the customer. Refers to valued, unique and tangible product differences that exist only in your suppliers products. A supplier whose product or service is unique or has special attributes that you desire restricts your ability to shop around. Any cost associated with changing supplier reduces the frequency that businesses will change suppliers. These costs can be anything from the legal costs associated with new contracts, your time, spare parts or unique tools required, setup costs or even the risk of the unknown. Refers to an alternative product or service that is not in your supplier's industry. Quite often this is measured by looking at the market share of the top 4 suppliers to your industry, if the top 4 suppliers have 90% of the market then they can drive price if the top 4 have 30% of the market then you can drive price. Refers to the supplier’s capacity and the volume that you purchase. If a supplier is a high volume of producer with limited ability to scale back production, then they need to sell everything that they produce. If demand is less that supply then the higher volume buyers will have the bargaining power. If your business is a low volume buyer then you are unlikely to have much bargaining power, whereas if you are the high volume buyer then you will have more market power. Most negotiation effort is directed towards the suppliers who represent the largest spend for your industry. You are likely to just accept the price of low value items or for items that are trivial in comparison to your total spend. Refers to the role your supplier’s product plays in differentiating your product or service. If your business is successful because of a quality that is inherent in your supplier's product your supplier will have the negotiating power. Is it likely that your supplier could improve their profits by getting into your line of business? The following free strategic planning template can be used to determine if each of the factors that affect the Bargaining Power of Suppliers has a positive or negative risk. You can then give an overall rating for this force. 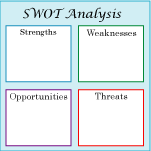 After completing your analysis you should transfer the key highlights to your SWOT analysis. Generally, you only need to add high level commentary to your SWOT. Given that Porters five forces is an industry analysis technique you will only need to update the opportunities and threats in your SWOT analysis. Why not take 5 minutes to learn how to use all five forces in the porter model to ensure you can analyze and understand the nature of competition in your industry. Thank you for visiting our Porter Model section.